Like prisoners emerging from a lifetime behind bars, a group of chimpanzees step blinking into the sunlight with what appears for all the world to be a wave and a smile. And they have much to be joyful about. For this is the first time they have felt grass under their feet and breathed fresh air for 30 years. 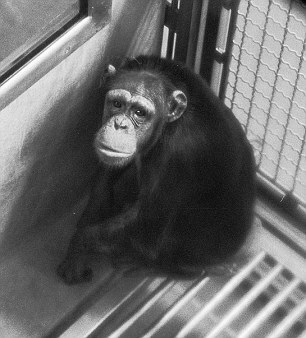 Though a few of the chimps were born in captivity, most were kidnapped from African jungles as babies and flown to Europe, where they were locked in metal laboratory cages to be used in a long series of experiments. Horrifyingly, their mothers – who would usually raise them for six years – were all slaughtered. The aim of the firm that bought them was to find a v accine to combat Aids. 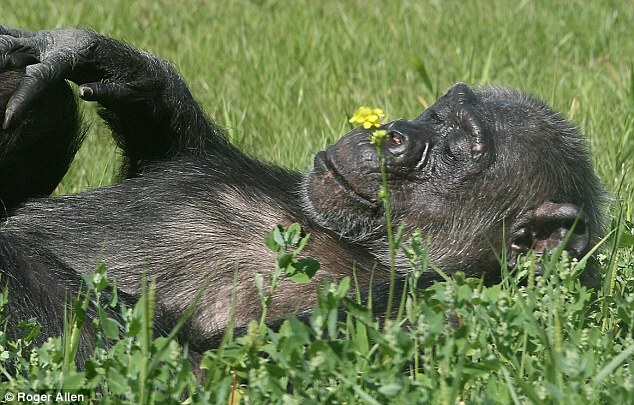 Because chimps share 99per cent of the gene code of man, they seemed natural subjects for study. But that meant they suffered terrible cruelties in the years that followed, including being injected with the HIV virus. Hooked up to machines and pumped full of chemicals, they were truly prisoners of utter despair. With no stimulation, no nurturing love and no hope, many were driven to the brink of madness and sometimes beyond. 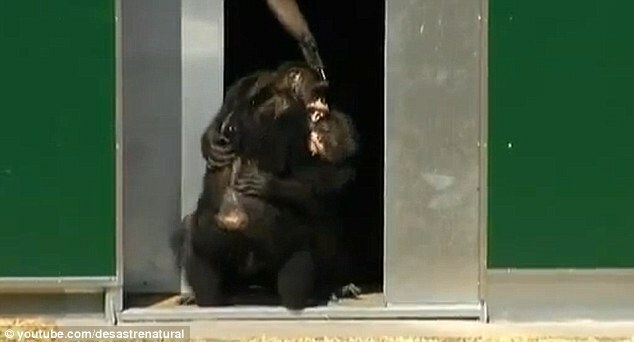 But their ordeal finally ended on Tuesday when the 38 surviving chimps were released into a £3million sanctuary in Austria, allowing them to feel the nurturing contact of their fellow chimps after years of being separated by bars and bullet-proof glass. Now, Susi, David, Clyde, Lingoa, Moritz and all the others will be free to enjoy the remainder of their lives together, thanks to the unstinting efforts of a 59-year-old conservationist named Michael Aufhauser. The founder of an animal charity that operates in four European countries, he oversaw the construction of the sanctuary outside Vienna, which is built on the site of a defunct safari park. ‘Who knows what scars they carry on the inside,’ says Mr Aufhauser. Several years ago, the giant American pharmaceutical company Baxter took over the Austrian laboratory, and immediately announced it had no intention of continuing the testing programme. 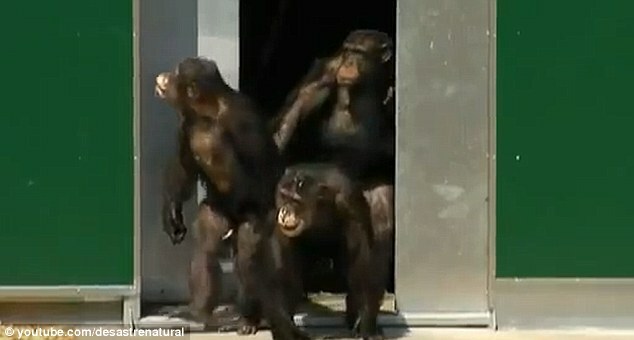 More than that, its bosses decided the firm had a moral responsibility to improve the life of the chimps, who can live to the age of 50 or 60. They were moved to an indoor shelter in a safari park, but when it went into liquidation in 2004 the building of an outdoor sanctuary was stopped and the animals were forced to spend several more years in cages. Must Anti-Vivisectionists Forgo Medicine and Medical Procedures Connected to Animal Research? That last picture just makes me so happy and I have a BIG smile on my face right now. They are so happy and content. I can only image their happiness after the horror they have been living for the last 30 years. Enjoy your retirement from the Hell Hole that we (the humans) imprisoned you in for the last 30 years. May the rest of your lives be filled with love, happiness and peace, YOU MOST CERTAINLY DESERVE THAT.